As you may or may not have heard, Microsoft has announced the next version of their messaging suite, Microsoft Exchange 2010, will be available later this year! The new version of Exchange hosts many improvements and feature additions on top of Exchange 2007. One of the most exciting ones announced, was a feature called Database Availability Groups, or DAG’s. In this four part series, we’ll go over the concepts of DAG’s, and how to get one working and test it out. So, what is a DAG? A DAG is the evolution of the CCR and SCR functionality that was introduced in Exchange 2007. CCR allowed you to keep two copies of your database’s in a cluster, protecting against both server failure, and a corruption of the database. SCR allowed you to add site resiliency to your Exchange design, by replicating data to your disaster recovery site, and activating it if needed. CCR and SCR have now been rolled into the DAG feature. The best part about it, is most of the legwork, as well as the activation of the data, is automatic! It still uses the concept of log shipping for the replication, although its been much improved. Let’s get into a little bit of how it works. If you notice, I am under the Organization Configuration node, not the server configuration node. 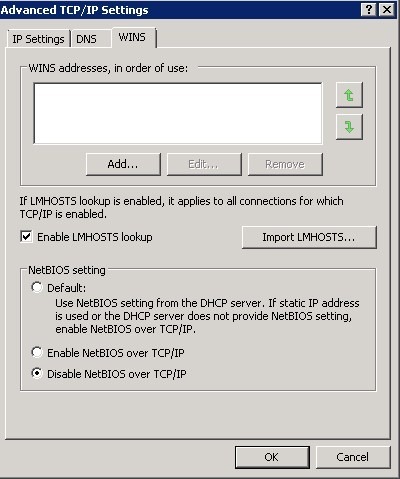 The picture shows two database’s, each hosted on different servers. If you notice on the bottom half of the screen, the console lists the Database Copies that make up this particular database. A DAG consists of multiple copies of a set of database’s, that can be activated as the active copy at any time. You can have up to 16 servers in a DAG, meaning you can have up to 16 separate copies of one database! For example, you could have two servers in your main datacenter, each with a copy of one database for high availability in your main site, and then a third copy of the database in your disaster recovery site, in case you lost your main datacenter. Members of a DAG do not have to be members of the same AD site, like stretched 2008 CCR clusters did. Each of these can be activated at any time, automatically if you have a failure, or manually by running some commands. The last major point, is that no client connects directly to a mailbox server anymore, including outlook. 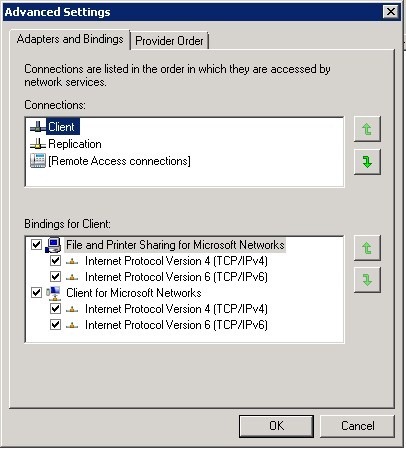 Outlook clients connect to a Client Access Server, just like a POP or IMAP client does to connect to it’s mailbox. This allows for incredible quick failovers (30 seconds or less), of the Outlook client to a new copy of the database. All of the Exchange 2010 is installed, as you do NO customization during the install, all is done after. This means you do not have to re-install Exchange if you decide down the rode to make it part of a DAG. Let’s take a look at the network configuration. First, the NY server. Hmm, seems like this most certainly pertains to us. 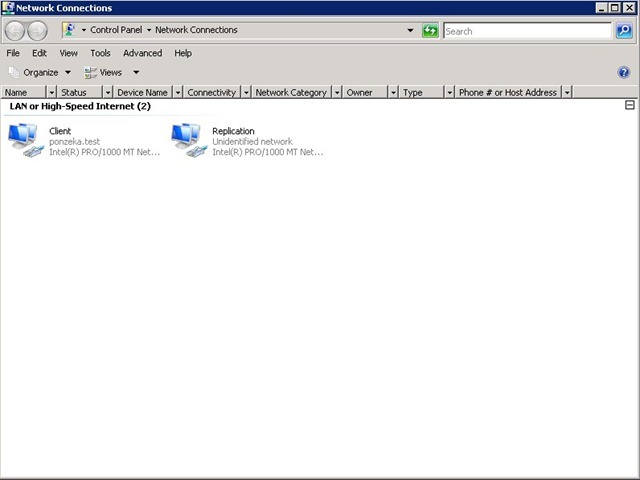 Also, DAG’s still use the Windows Failover Clustering feature of Windows Server 2008. 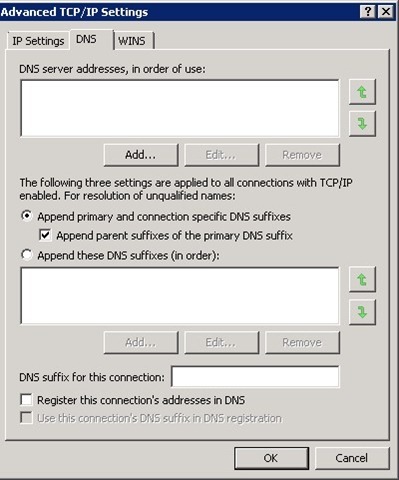 Have a configuration with a default gateway on the replication or heartbeat NIC is not supported, as very odd behavior can be exhibited. 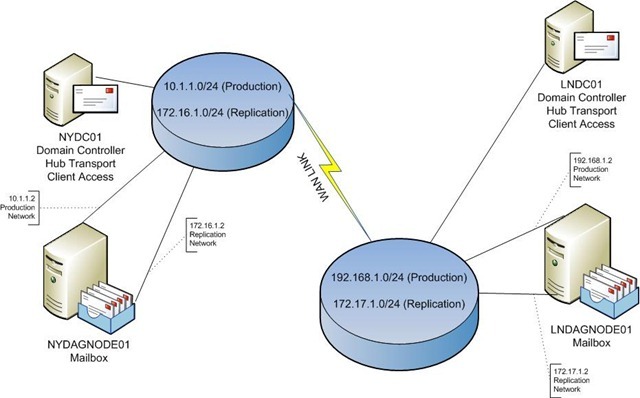 So, then the question is asked, well the network’s are routed, how do we tell the replication NIC on one node, how to get to the replication networks of the other nodes? 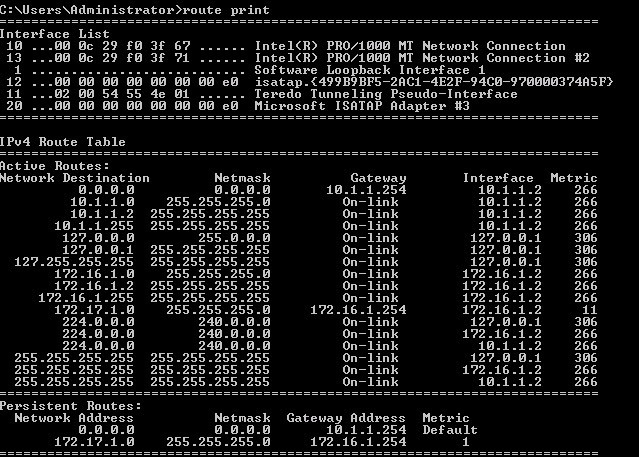 For this, we add static routes to the individual server’s routing tables. Tim McMichael had a great article about this, and you can read it here. Okay, that does it for part 1 of this series. 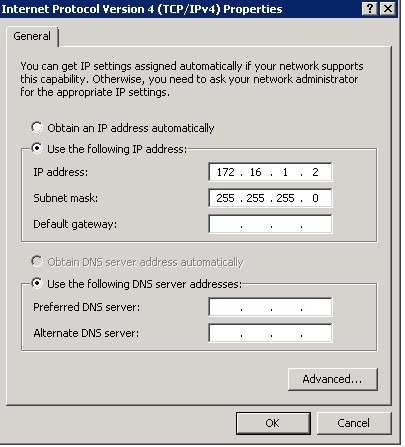 We went over the basic concepts of the DAG, and how to set up the networking for it. In the next section, we’ll go over how to create the DAG, and add nodes to it. Stay tuned. for 172.17.1.0 to connect to 172.16.1.0 network, do i have to create a vlan or any special configuration needed on the firewall routers?